The YZ250X builds on a Yamaha legacy of high-performance two-strokes that dates all the way back to 1961 when the company released its YDS2C two-stroke twin “with scrambler kit.” The YDS2C was the first Japanese-built off-road racer to be available in a dealer’s showroom, and it was followed by a string of successful two-stroke off-road models, including the legendary DT-1 250 enduro. It has been a while since Yamaha released its last – and previous best – two-stroke off-road racer, the YZWR (aka the WR250Z), which enjoyed a long production run from 1989 to 1998. The YZWR was discontinued just as the four-stroke boom took over the dirtbike world. Developing the YZ250X all these years later was a piece of cake for Yamaha, which remains as the only Japanese OEM to carry the two-stroke torch in motocross. With the state-of-the-art YZ250 already in the family, all Yamaha needed to do was make some tweaks to the platform to bring the YZ250X to light. 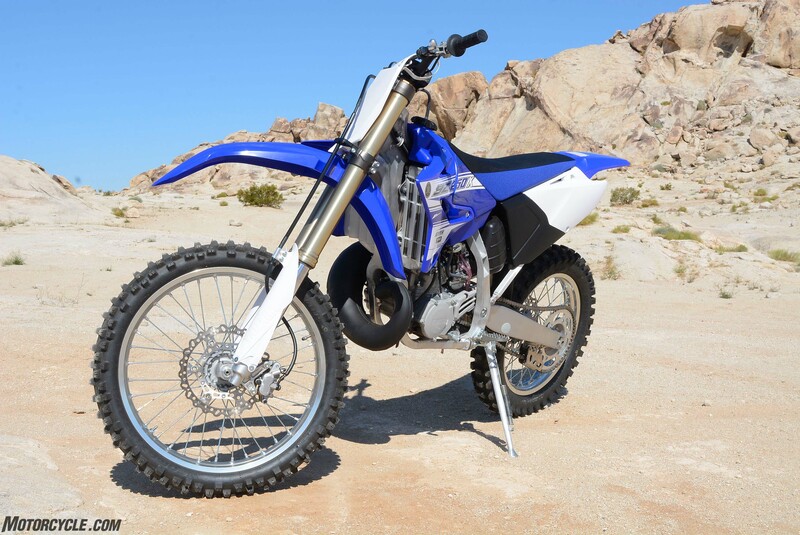 The YZ250X’s 249cc two-stroke Single features the same bore and stroke as the YZ250, but it has a slightly lower compression ratio, milder ignition timing and more off-road friendly power valve settings. The X’s pipe is also redesigned to provide better ground clearance. The YZ250X’s 249cc two-stroke Single features the same 66.4mm × 72.0mm bore and stroke as the YZ250, but it has a slightly lower compression ratio and milder ignition timing in its new CDI unit that soften its initial hit while extending it over a broader rev range. 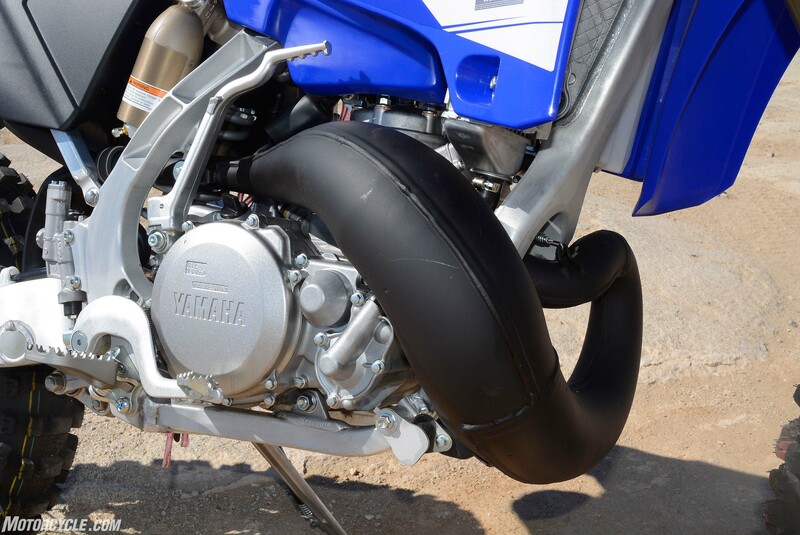 The X’s pipe is also redesigned to provide better ground clearance, and its powervalve settings have been re-tuned to open more broadly and gradually than the motocross version, which helps low-end power while also giving the YZ250X plenty of mid-range thrust and top-end screamability. 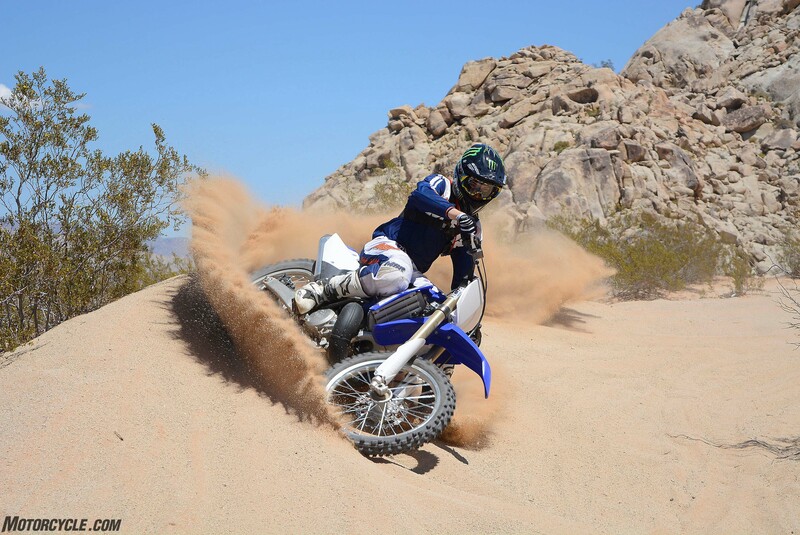 While Yamaha claims that the YZ250X is designed for GNCC-style closed-course competition through the woods, we couldn’t resist putting our test bike through its paces at our favorite local desert spot, which offers a mix of vision-blurring high-speed terrain, deep whoops and sand as well as technical rock sections and single-track terrain – everything necessary to put the X to the test. 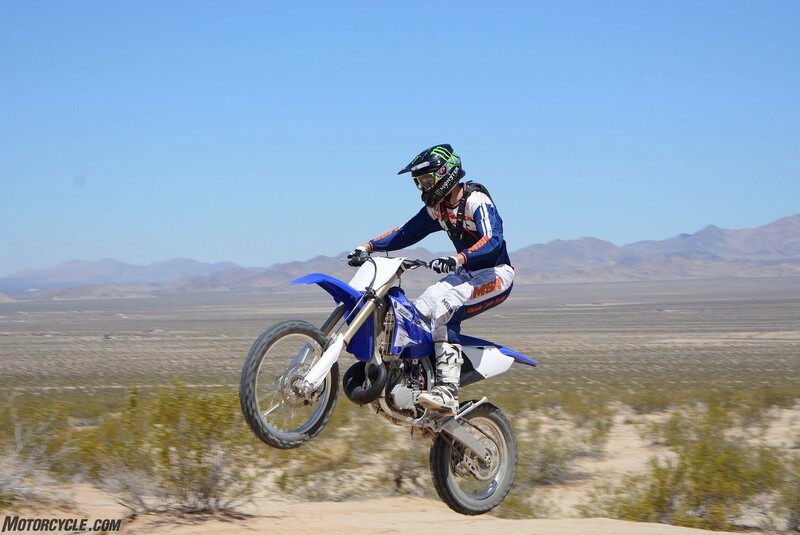 It should be noted, however, that the YZ250X does not come equipped with a U.S. Forestry-approved spark arrestor, so you’ll need to add one to avoid being hassled by “the G” while riding on public land. The YZ250X’s engine starts easily, and once warmed up it impressed us immediately, with a smooth low-end bark that transitions seamlessly into a silky mid-range and a warp-drive top-end. Carburetion through its 38mm Keihin PWK carburetor is crisp and clean, thanks to a throttle position sensor that is designed to help tailor the air/fuel mix throughout the rev range – almost like fuel-injection, but not quite. It gives the X excellent throttle response regardless of what gear you’re in or where you are in the powerband. Everyone from our national Hare & Hound-caliber experts to rank novices raved about the Yamaha motor. It’s smooth as silk yet oozes power everywhere, and it revs to the moon. It’s easy to ride fast and can make you feel like an off-road hero, which only adds to the fun factor for riders of all skill levels. 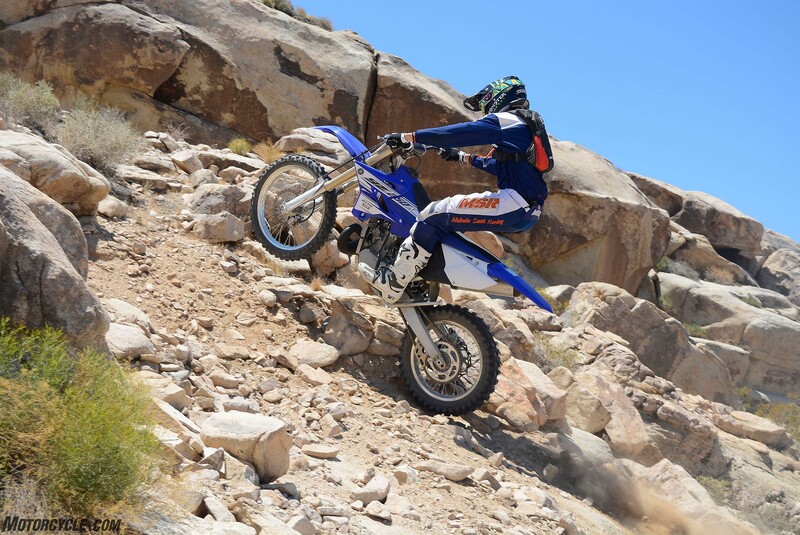 The YZ250X’s engine and wide-ratio five-speed gearbox are equally at home in rocky technical sections like this one or in high-speed terrain. There’s always a gear for the task at hand, and tractable power is always plentiful. The YZ250 and YZ250X both feature five-speed transmissions and 14/50 final drive ratios, but the YZ250X’s five-speed is a wide-ratio unit designed to be more effective in everything from tight woods sections to wide-open terrain. The first two gears are the same on both models, but from there the X’s transmission differs, with a slightly lower third gear ratio than the YZ but with much taller fourth and fifth gear ratios. Yamaha says that fourth gear is effectively the same as making the final drive a 14/48 while fifth gear is like dropping to a 14/43 – or about the closest you can come to light speed in wide-open terrain. The X’s shifting action is smooth and precise, even though we found many instances where the combination of the X’s broad power and the breadth of its gearing allowed us to just keep it in third gear or fourth gear and not shift at all. The engine had no trouble taking up the slack in a wide range of trail conditions. The transmission is a perfect fit for off-road use. Fourth and fifth gears in the YZ250X’s transmission are best left for warp-speed off-road riding. And although you’ll hardly need to touch it once underway, the YZ250X’s cable-operated clutch features a light pull and easy modulation, proving that a hydraulically actuated clutch isn’t a necessity in the off-road world. The only real advantage is that a hydraulic unit will automatically take up the slack at the lever as the clutch plates wear, but Yamaha has fitted the X with the same “works-style” lever barrel adjuster found on the YZ, which makes for easy, on-the-fly clutch-play adjustment. The light pull comes courtesy of clutch springs that are 10% lighter than the YZ’s. As you can see here, the YZ250X also uses Yamaha’s backbone-style aluminum frame. The motocross-derived chassis works well in almost all off-road situations but gets just a tad squirmy at top speed. About the only place where the YZ250X’s motocross heritage shows is in its backbone-style aluminum chassis, which shares the same geometry as the YZ250. It also works well in the off-road environment, as it steers with precision and is generally very stable at most speeds. However, our expert testers noticed a slight tendency for the X to squirm when pinned at ultra-high speeds. It’s far from scary, and it’s something that an aftermarket steering stabilizer would remedy, but it is noticeable. Beyond that, the X’s chassis feels light and flickable, making it a blast to ride when snaking through rocky, technical terrain. 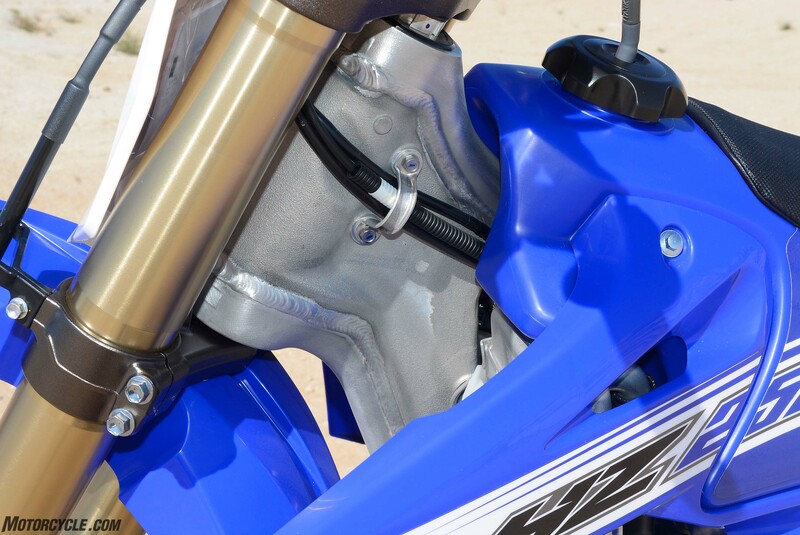 The YZ250X’s handling prowess is enhanced by its fully adjustable KYB spring-type fork with speed-sensitive damping up front and fully adjustable KYB piggyback shock out back. The X gets the same front and rear spring rates as the YZ, but Yamaha revised the valving shim stacks to give the suspension a more progressive feel for off-road terrain. That helps it deliver a smooth 11.8 inches of front wheel travel and 12.4 inches of rear wheel travel with reduced deflection in small bumps or rocks. The suspension definitely feels softer than its YZ counterpart at higher speeds, although pounding endless strings of desert-style whoops failed to elicit a negative comment from our testers. The setup does an excellent job of maintaining control without bottoming while retaining a comfortable ride. That’s a real benefit in long off-road races. The YZ250X is also very comfortable to ride for the long haul, something we were happy to learn during our day in the desert. Its YZ-bred ergonomics are slim and its seat, pegs and bar position aid in its roomy overall feel whether seated or standing. The YZ250X’s brake components are identical to the YZ250’s. Nissin calipers clamp wave-style rotors measuring 250mm up front and 245mm out back. While we mostly found the brakes to be powerful enough to slow the speedy YZ250X, one tester felt that the rear brake is a touch on the sensitive side, but that’s nothing that a pad change wouldn’t fix. Yamaha delivered an excellent off-road racer in the YZ250X, but there are a few areas that drew complaints. For an off-road racebike like the 250X, we think it’s a faux pas to deliver it without including a factory skid plate and hand guards. We would also like to see the YZ250X delivered with a spark arrestor for its factory muffler so that the bike can easily be converted for riding on public land. And while the X also features large-capacity radiators with 10-row cores to optimize engine cooling, we believe that riders in the Eastern part of the U.S. would appreciate a fan system to further aid cooling in the slow and often muddy conditions in their neck of the woods. 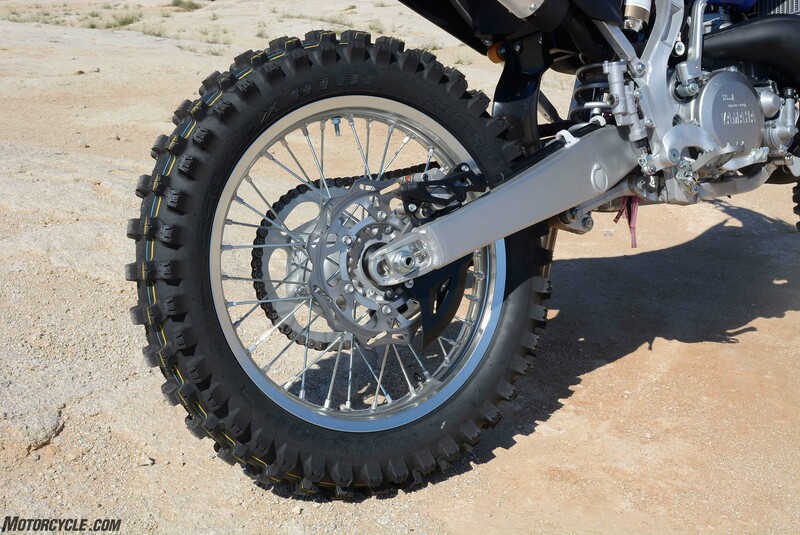 An 18-inch rear wheel and Dunlop AT81 off-road tires, front and rear, are standard equipment on the YZ250X (Yay!). A skid plate and hand guards are not (Boo!). On the other hand, Yamaha made the right moves by adding an 18-inch rear wheel and a 2.1-gallon fuel tank to the X. The Dunlop Geomax AT81-shod wheel is practically an off-road requirement as it allows the fitment of a tire with more sidewall, which flexes more for better traction in soft terrain and rocks while also doing a better job of guarding against flat tires. The front and rear AT81s are an excellent tire choice, delivering consistent traction over a wide range of surfaces from sheer rock faces to deep sand. The fuel cell obviously extends range, although our whiny desert brigade naturally wanted to see an even larger-capacity tank. But even without all of that stuff, the YZ250X is truly a bargain-priced off-road stormer. At $7,390 it is a lot less expensive than its main rival, the KTM 250 XC, which retails for $8699. If you’re a potential buyer who has the budget for either, then you can certainly afford to add a skid plate, hand guards and other accessories to tailor the YZ250X to your needs, and maybe even have some change left afterward. 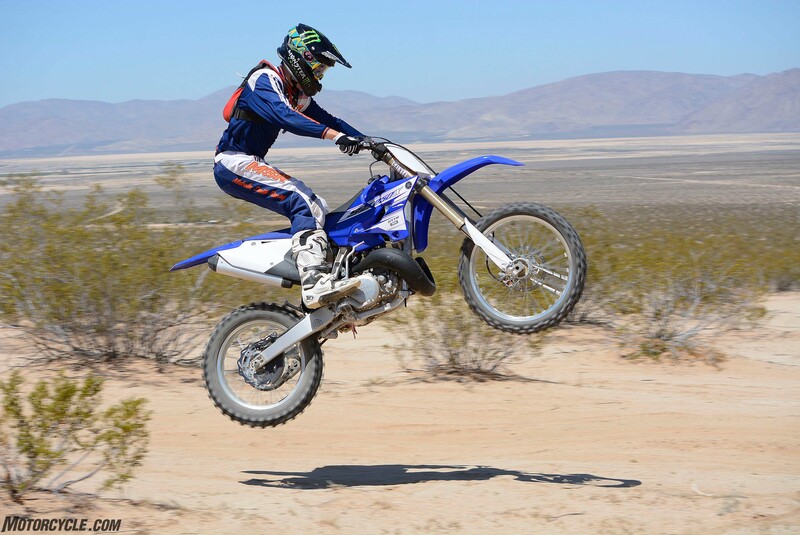 If not, the YZ250X’s performance will still get you in the game. So, build it as you go. And that’s something we seriously would consider, because we dig the Yamaha YZ250X in a big, big way. Its engine flat rips while delivering that zingy two-stroke siren song, its suspension is dialed-in for off-road racing right out of the crate, and its handling and ergonomics all but guarantee that you can pick your way through technical sections or pile on the miles in comfort. 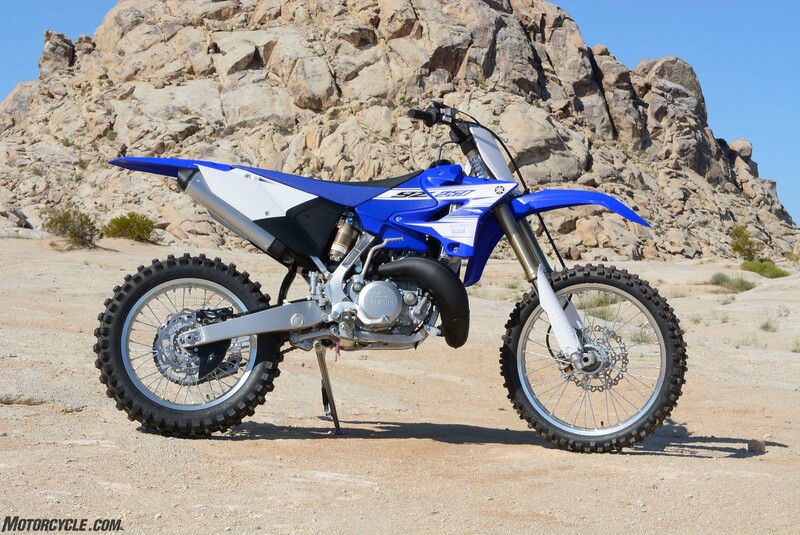 Whether you ride in tight woods or across expansive desert terrain, the YZ250X is one awesome off-road motorcycle.